A simple, traditional way to brew some fresh coffee. Percolators are great for people who just want a simple pot of fresh coffee without the fuss. Coffee percolators are traditionally used on a stove, but electric models are also available. 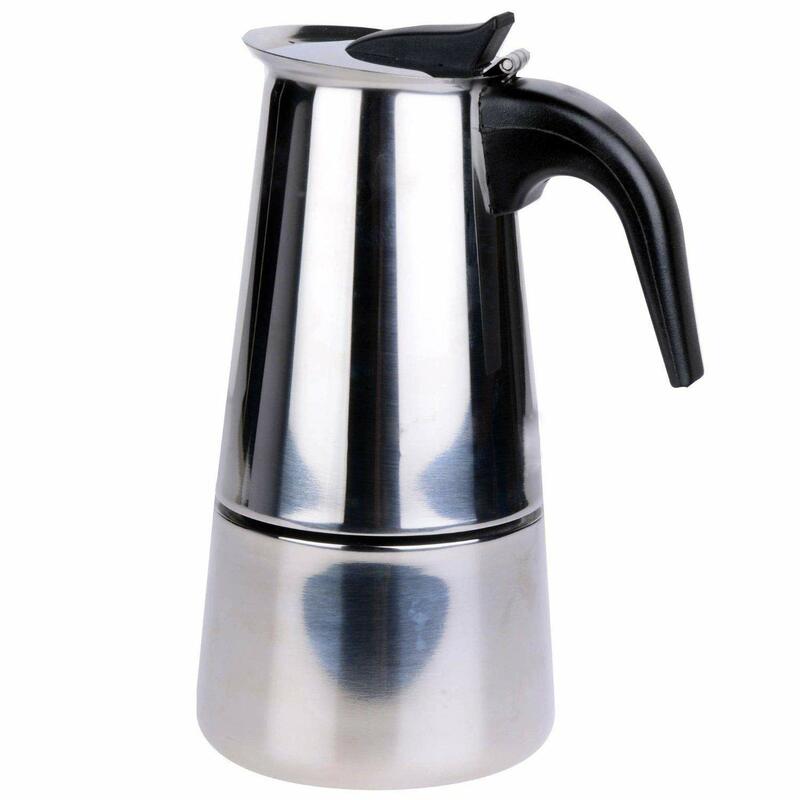 Percolators were used before the adoption of drip coffee machines in the 1970’s. They work by using steam to push boiling water up an internal spout to reach ground coffee beans at the top. It’s argued that the aroma from brewing percolators is far superior to other methods of making coffee, but they are more complicated to use as they require a degree of understanding and finesse. What are you looking for in your percolator? 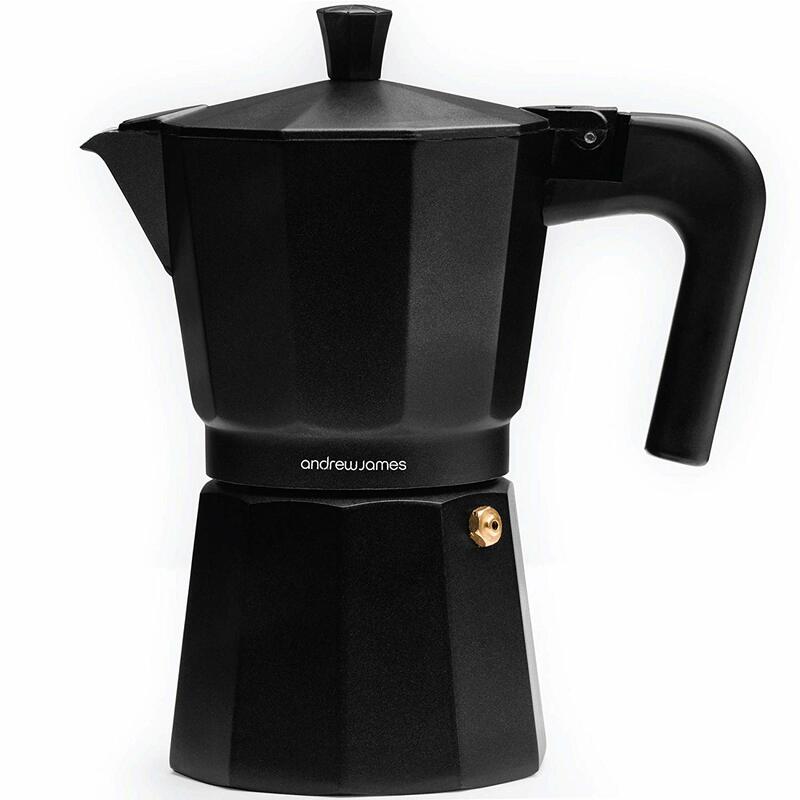 Make Italian-style espresso in your own kitchen with the Andrew James Moka Stove Top Percolator. Rustic and durable, the 6-Cup Moka Percolator brews up to six servings of strong coffee the old fashioned way. With no electronics or complicated operation, enjoying your favorite coffee drink has never been easier or more economical. Crafted from solid cast aluminum, the Moka Percolator requires no external heating source. It brews right on your hob or range. Heat forces liquid from the brewing chamber up a centerline spout and into a collecting chamber, where it remains hot and tasty and ready to serve. The Moka features a durable stainless-steel valve, a flip-top lid, and the cool-touch handle does not conduct heat, meaning you can take the Percolator directly off the stove by hand without a pot insulator and pour right into your mug. The silicone gasket is non-reactive and doesn’t dissolve, melt, or degrade, leaving nothing to spoil the flavor of your brew. A replacement gasket is included. The Moka Percolator is compatible with most ranges and hobs with gas or electric heating elements, including caping stoves and AGA cookers. Because the construction is magnetically inert, it is not compatible with induction heating. For best results, brew coarsely-ground beans. No electronic parts means nothing to break or short out. The Moka Percolator is simple to operate right out of the box. For added peace of mind, though, the Percolator comes with a 2-year manufacturer’s warranty. Based in the UK, Andrew James is a family-run business renowned worldwide for its high-quality household products and appliances for all budgets and all levels of expertise. The company is committed to eco-friendly production and excellent customer service. 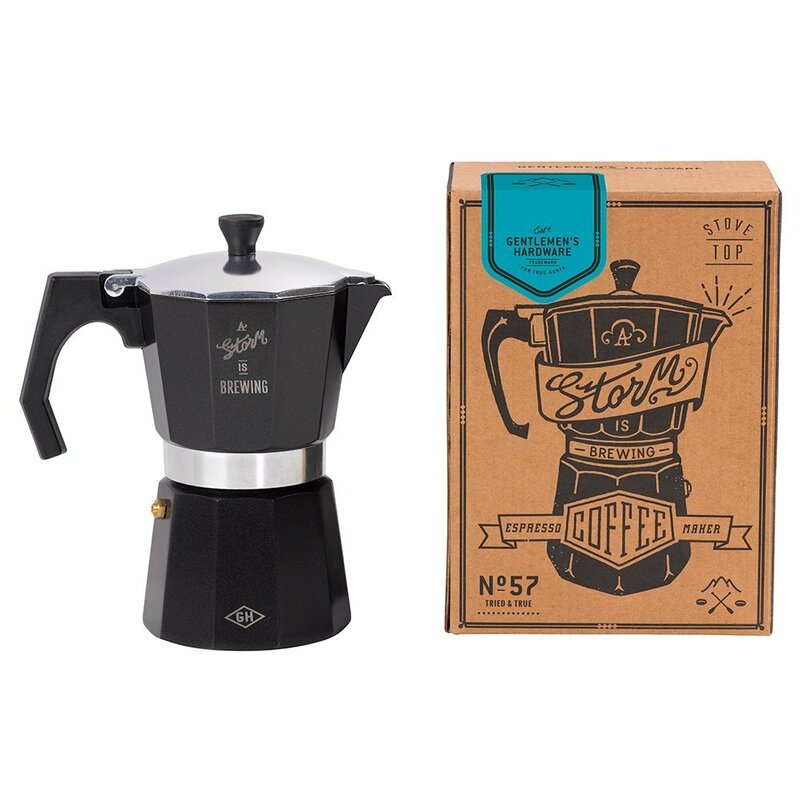 A stove-top espresso maker that is an affordable, essential addition to any coffee lover’s cookware collection. Beneath the silver veneer is high-quality stainless steel construction. Unlike most stovetop coffee makers, constructed from aluminum or lower-purity steel alloy, the FLAMEER Stovetop Moka Coffee Pot can be used on an induction stove, which heats cookware via magnetic current rather than open heat. The Espresso Maker can also be heated on gas or electric ranges and hobs, as well as over open flame or a camping stove. The FLAMEER Stovetop Moka Coffee Pot features a unique three-layer filtering design, which allows heat to be distributed evenly throughout the brewing chamber, maximizing the flavor and aroma of the coffee. As the brew heats, coffee is forced by internal pressure up through the central spout and into the serving chamber. The Espresso Maker is designed with a safety release valve to modulate the pressure, extracting the perfect espresso from the grounds. For best results, use coarse-ground beans. Built to last from thick steel plating, the FLAMEER Stovetop Moka Coffee Pot is compact and simple to operate. It features a hardy flip-top lid and a heat-resistant handle that can be gripped safely with bare hands, even after heating, for easy service. The handheld portions of the kettle feature brass coloration. Beautiful and easily transferring heat, stainless steel makes excellent cookware. It does not rust, corrode, or add metallic flavor, preserving the taste of your coffee for the entire life of the appliance. It is not-reactive and does not contain chemicals or toxic agents. Hand-wash only, do not machine wash.
Add a stylish, functional set piece to your silver coffee service. Add a touch of class to your stovetop espresso preparation with the FLAMEER Stovetop Moka Coffee Pot. Eschewing the industrial/functional aesthetics of other stovetop espresso makers, FLAMEER’s take boasts elegant craftsmanship worthy of high-end decor and suitable for any silver coffee service set. The Gentlemen’s Hardware Coffee Percolator is constructed from industrial-grade stainless steel to stand the test of time, making it a great investment in your coffee-enjoying future. When the brewing chamber is heated to boiling, coffee brews and is forced up through the central spout into the serving chamber. There are no electronic parts to break — it cooks on the heading element of your stovetop, gas or electric. It can be heated over a flame, charcoal, or a camping stove as well, making it an all-around versatile coffee maker. Brew up to six cups of espresso from one use, using coarse grounds for best results. The Gentlemen’s Hardware Coffee Percolator produces strong, dark coffee suitable for espresso shots, as well as barista specialties like the Americano, caffe latte, or cappuccino. Hand wash only, do not machine wash. The Percolator comes in an elegant kraft gift box, measuring 6.1” x 4.3” x 8.3”. The serving pitcher features a flip top and an insulated handle that remains cool to the touch even when the Percolator is heated, allowing you to remove the pot from the stovetop with bare hands and serve directly into mugs. Rugged and stylish, the Percolator comes engraved with the legend “A Storm Is Brewing.” Gentleman’s Hardware is a registered trademark of Wild and Wolf Inc., an industry leader in thoughtful, design-forward lifestyle products. The stovetop espresso maker dates back to the 1800s. 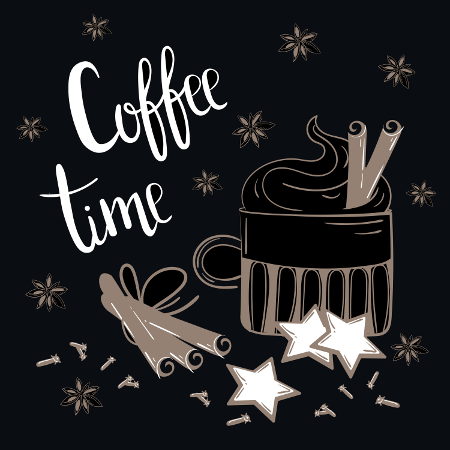 Invented by America-born British soldier/scientist Count Rumford, it was first used to brew coffee over an open flame or heated metal hob. The Gentleman’s Hardware Coffee Percolator continues that proud tradition. Add a piece of heritage coffee-craft to your cookware collection. Brew espresso the old-fashioned way with the Gentleman’s Hardware Coffee Percolator. Whether luxuriating in your kitchen or camping in the woods, this traditional stovetop coffee maker is built to last and goes with you everywhere you want to enjoy a strong brew. The Voche Stove Top Percolator is a stove top coffee maker that is ideal for anyone who enjoys making coffee the “old fashioned” way. It is large and brews up to 6 cups of espresso. This percolator produces a richer, more flavorful coffee than the typical coffee brewed from electric pots. The appliance is compact and extremely easy to use. In addition, it’s made in a retro design that makes it very easy to clean. Stainless steel exterior. Has a stainless steel exterior that is highly resistant to physical damage e.g falls, resistant to heat and chemical damage. In addition, stainless steel is also rustproof. This metal consists of Nickel and Chromium, elements which are highly resistant to corrosion. Compact. Has a base diameter of 9.5cm and a height of 19cm. The percolator can fit on counters with very limited space. Creates 6 cups of coffee. It is convenient for large families. Sleek appearance. It blends well in any kitchen. Pressure relief valve. Included for safety purposes. Brews coffee with a more robust flavor. It extracts more flavor from coffee beans than the conventional coffee maker. Reasonable price. The purchase price is only 10 pounds. Ergonomic handle. It is easier to grip to facilitate lifting of the percolator and pouring of coffee. The handle’s strong grip also reduces the probability of slips. Versatile. Works well on both electric and gas powered stovetops. It is also suited for use in a campfire. Insulated lid and handle. Users are not required to use protective accessories when handling the percolator. The lid and handle have heat resistant plastic. 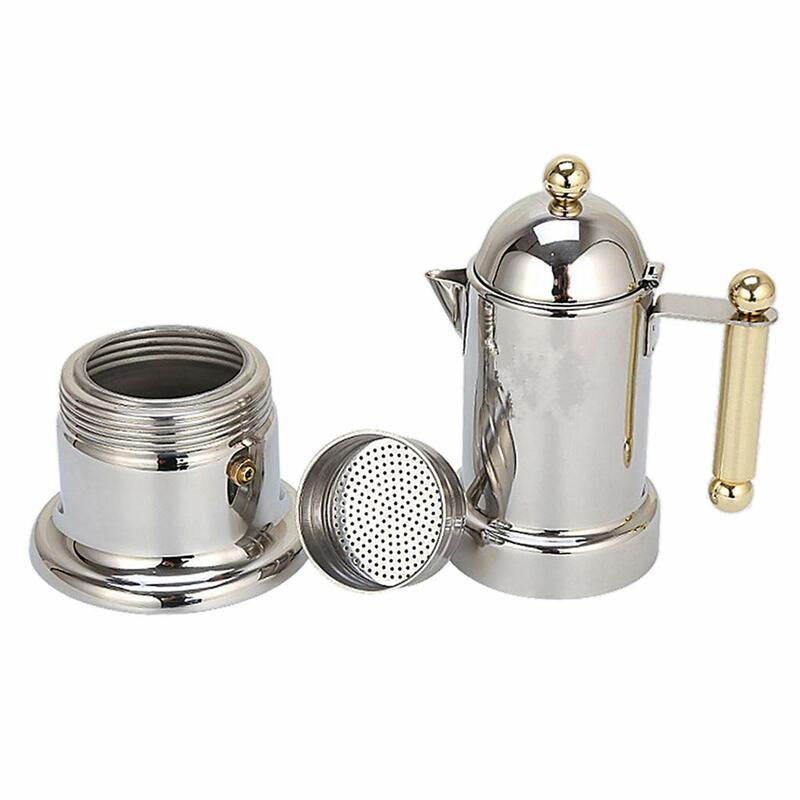 The Voche Stove Top Percolator provides espresso that has great depth of flavor. This appliance is super easy to use, highly durable, compact, and easy to maintain. If you enjoy making big batches of espresso or brewing coffee in the great outdoors then this is a must-have appliance. 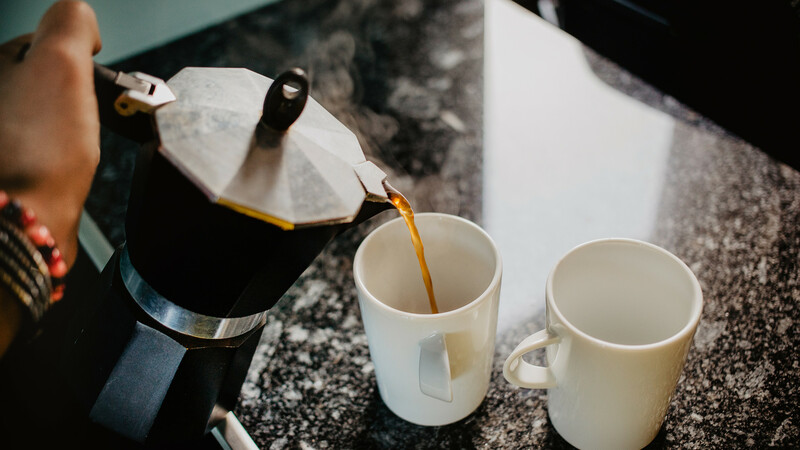 By purchasing the Voche percolator, not only are you guaranteed a highly effective appliance, but also a coffee maker that can be used in virtually all environments. Need some help? Check out our coffee-making articles and guides.